Dirty Diapers Pile Up In Portland Recycling Bins: 'It's Not Pretty' : The Two-Way Waste and recycling handlers in Portland, Ore., say they're seeing an unfortunate side effect of the city's reduction in garbage pickups: 120 pounds of dirty diapers a day, tucked into recycling bins. Portland recycling handlers say they've seen more diapers in recycling bins after the city switched to biweekly trash pickups. 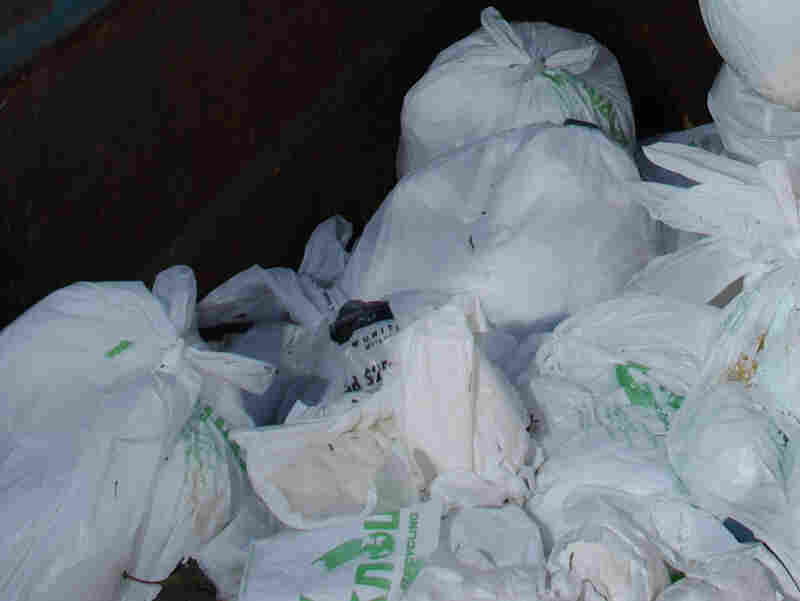 A file photo shows bags of diapers in a container at a California recycling facility. Waste and recycling handlers in Portland, Ore., say they're seeing an unfortunate side effect of the city's reduction in garbage pickups: 120 pounds of dirty diapers a day, tucked into recycling bins. "It started when the city went to every other week garbage pickup," Far West Fibers President Keith Ristau tells Oregon Public Broadcasting's Cassandra Profita. "Prior to that you'd get a dirty diaper maybe once a month. Now we get 60 pounds per shift. It's not pretty." The imposing poundage is actually a drop from the 90 pounds of dirty diapers that landed at Far West's processing center shortly after Portland decided to encourage its citizens to recycle and compost household waste rather than send it to the landfill. Other than the diaper issue, the new emphasis on recycling and composting seems to be a success. "When the city of Portland launched its curbside composting program in October 2011, it simultaneously reduced trash pickups from once a week to once every two weeks. But recycling and compost bins are still emptied weekly," Profita reports. "In the following year, the volume of garbage collected from residential curbsides dropped by 38 percent, but the city also sent reprimanding letters to 3,000 households that were caught putting trash in their recycling bins." Those households are evidently tempted by a chance to get rid of stinky items more quickly than the two weeks soiled diapers and other material could spend in garbage cans. And a report by Portland's KGW TV last year found that baby diapers are only part of the problem — adult diapers account for about 40 percent of those found in the recycling canisters. Far West Fibers' Ristau admits that diapers are only a small percentage of the material his company handles — "but it's by far the most disgusting percentage," he tells OPB. City officials say they're working to solve the problem as people adjust to the new system. They're also offering upgrades to larger trash containers.